SANTINI - Partie Septentrionale du Royaume de Naples..
SANTINI, P. / REMONDINI, M. - Partie Septentrionale du Royaume de Naples..
Partie Septentrionale du Royaume de Naples.. - SANTINI, P. / REMONDINI, M.
Size : 18.9 x 23.2 inches. / 47.9 x 58.9 cm. 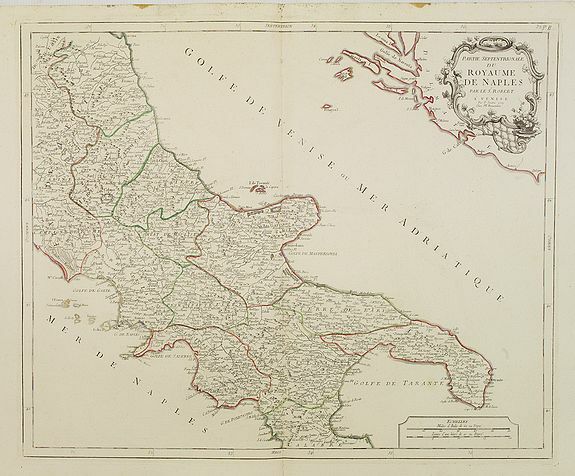 Description :Finely and crisply engraved map of southern Italy, except the region Calabria. Ornated with a large title cartouche in the upper right corner. With remarkable topographical detail. Relief shown pictorially. Condition : Slight marginal spotting. Else very fine condition.